Ciao! My name is Zindy and I am a junior from Chicago, Illinois studying Advertising/Public Relations and Psychology at Loyola University Chicago. I have always suffered from wanderlust and am thrilled to be fulfilling that desire this spring 2017 at JFRC. I have never been to Europe so I am very excited to immerse myself into the different cultures in order to become more culturally competent. I am most excited for all of the pasta, macaroons, and gelato-- as any person should be! A few weeks into my study abroad experience, I was unsure I would undergo this transformation everyone was telling me about. I was uncomfortable, a little homesick, and afraid I was doing something wrong. As I begin my last week in Rome, I reflect on the last 3 and a half months and realize how much I have changed. I was born and raised in Chicago and have spent my whole life in the same city. Growing up, my dad loved to road trip and brought me along since the young age of…2 weeks! It seems as though I was meant to love travel since a young age. As a sophomore at Loyola, I realized I had never truuuly been taken out of my comfort zone. Chicago was familiar, Mexico was familiar (the only other country I had been to), and well, anywhere in the states is still America and the language is still English. 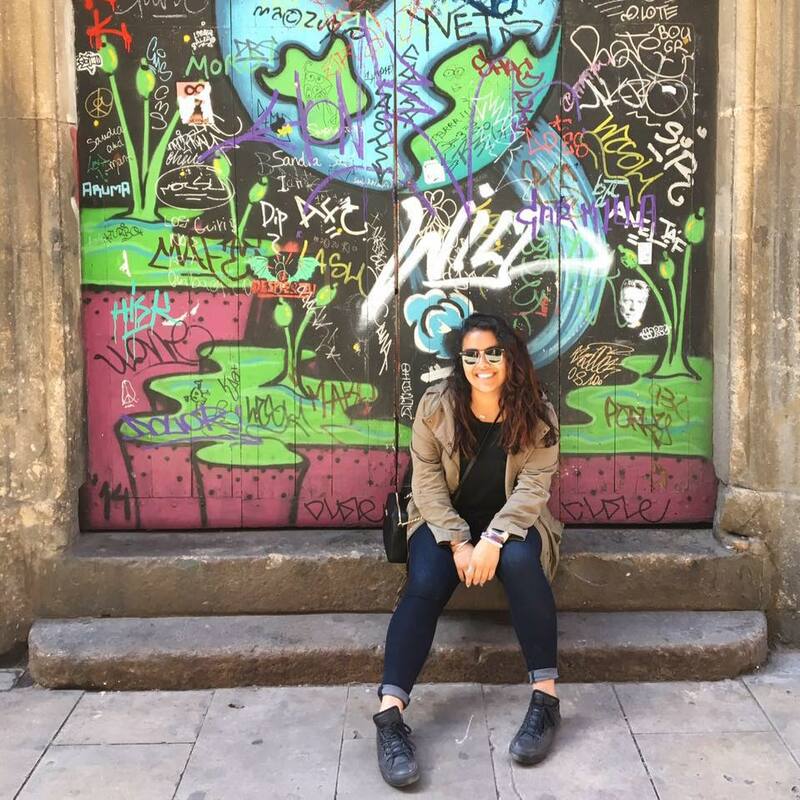 I signed up to study abroad at the John Felice Rome Center and was quickly accepted into the program. At the time, a year seemed so far away. I sit here now, about to finish my Junior year and about to return to Chicago in less than a week, truly inspired by my study abroad experience with a whole new perspective on the world. First, I want to say American privilege is real. I have never been more aware of that until I crossed the Pacific Ocean. Let me tell you, when you go to a foreign country and your Airbnb host who is a native of the country apologizes for their inability to speak English…American privilege has never stuck out more to me. I went abroad to force myself out of my comfort zone. I needed to be forced out of my comfort zone to appreciate the things I wasn’t aware I had or loved. I have grown more confident in myself and what I want out of this life. I am more sure now than ever about my education goals, career goals, and personal goals. Once I get started, nothing will get in my way. I am excited for the future. In addition, I needed to go explore different cultures and ways of life to appreciate my own culture more. Diversity is wonderful and I should be proud of my Mexican culture. Immersing myself in many different cultures made me more open to exploring my own and I have learned to appreciate and love my differences. Learning from all kinds of different people and really trying to learn a new language has given me a new perspective. Diversity is beautiful. There are things you simply cannot learn inside of a classroom. When you go abroad, the world is your classroom. Each flight, train, interaction, and footstep is a learning and new experience. Adventure awaits at every corner and I don’t know when I will ever get the opportunity to travel every weekend ever again, but I sure will long for the next trip to come. So, I’ll leave you with this. 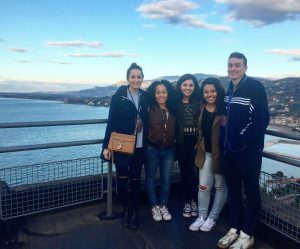 There is no “right” way to study abroad. Just be flexible, be open-minded, and breathe in every single moment. I had high expectations for my trip to Venice, and I can safely say my expectations were exceeded. 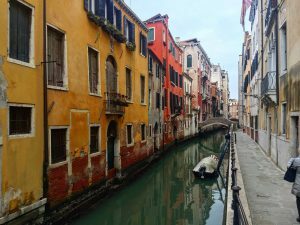 If you study abroad, Venice should most definitely be on your top 5 list! I arrived in Venezia, Italia at approximately 19:30. Right in front of my face as I walked outside of the train station, was the grand canal and beautiful, colorful buildings. Due to my lack of geography knowledge, I was not aware Venice was an island until I was planning my trip. My friends and I had to take a ferry down the grand canal to get to our Airbnb. Even in the dark and cold, Venice was beautiful. Seeing the lights of the buildings reflect on the water of the grand canal and breathing in the salt water air was quite the greeting. 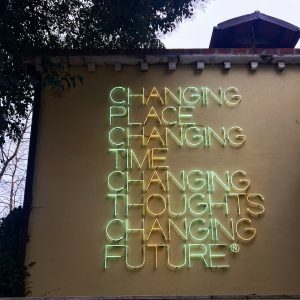 The following day, my friends and I visited the Peggy Guggenheim Collection Museum. This is a must do when you’re in Venice!! As someone who is very interested in art, I was stoked for this. Peggy had gathered quite the collection of art in her life. She owned pieces by Salvador Dahlí, Pablo Picasso, Andy Warhol, and Jackson Pollock. Getting to see Dahlí and Picasso pieces in person was incredible! 10/10 would recommend this museum. Later in the day, we visited the Libreria Acqua Alta. 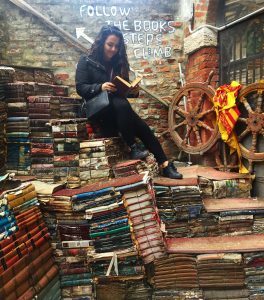 This is a famous bookstore in Venice that has many different books of all kinds, languages, and years. In addition, there is a very large gondola in the middle of the store FULL of books. And of course, in the back, there are steps made out of books that you can physically step on. The wear and tear from the books being outside and surviving the elements is visible but makes it that much cooler. Of course, my favorite thing about visiting Venice was the gondola ride. It wasn’t until I was on the gondola in the middle of the grand canal with the Rialto Bridge behind me and the gondolier yelling Italian that it really sunk in that I am really here…in Italy…studying abroad. I am having experiences that I never thought I would have, and especially at the age of 20. I have learned to fully immerse myself in the Italian culture and love the things I didn’t at first. I am forever grateful for my parents, who made it and continue to make it possible for me to be here. I am learning to live more in the moment and appreciate my surroundings. I am only a month into my study abroad experience, and I feel that I am already different than I was when I left Chicago. I highly recommend studying abroad to anyone who is able to. Everyone needs to be taken out of their comfort zones sometimes and view things from a different perspective. You learn differently when you study abroad. I am learning and experiencing things that could have not been possible sitting in a classroom. Coffee culture is drastically different. I love my Starbucks just as much as the next person, but I also love my daily normal brewed black coffee. Italians call that an “Americano.” In Italy, they really only have 3 major coffee drinks: a cappuccino, an espresso, and a macchiato (and no not the caramel sugary thing from Starbucks). Coffee is also never taken “to go.” Setting aside the time to sit and have my morning coffee is so different from my normal routine and may encourage me to enjoy the little things more! Carbs, Carne, and Cornettos. Don’t get me wrong, Italians are serious about their food and it’s delicious. I truly believed I could never tire of pasta and that I would be stoked to eat it for the next 4 months. However, I have tired of pasta. During a meal, the first dish is always pasta, second is meat (usually pork), and last is dolce (dessert). Italians also don’t eat a full breakfast like Americans. Breakfast is usually some sort of filled cornetto (croissant) and cappuccino (my favorite part of the day). Let’s not forget delicious bread is served at every meal. Better hit the gym, am I right? The language. This is my first time being in another country that is not Mexico or the U.S. I am Latina, and I am a fluent Spanish speaker. I have never been in a situation where I didn’t know how to communicate with others, how to read a menu, or understand what others are saying. This has truly been eye-opening for me and is pushing me to learn Italian and use it as much as possible throughout my time here. The time difference. Rome is 7 hours ahead of Chicago time. Although this isn’t really culture related, the time difference has been something I have found difficult to adjust to. Trying to communicate with friends and family back home is difficult because they’re just getting out of class/work by the time it’s 11pm in Rome. Also, when I’m waking up around 8am it’s only 1am in Chicago and everyone is (typically) asleep. However, my friends and family have made a serious effort to plan phone calls/face times/texts to keep in touch, and I am so blessed to have these amazing people in my life. The transition from living in Chicago my entire life to living in Italy was not initially easy for me and has definitely taken me out of my comfort zone. However, this experience has already changed me for the better and I am excited to see where these next 4 months will take me. Until next time, ciao!